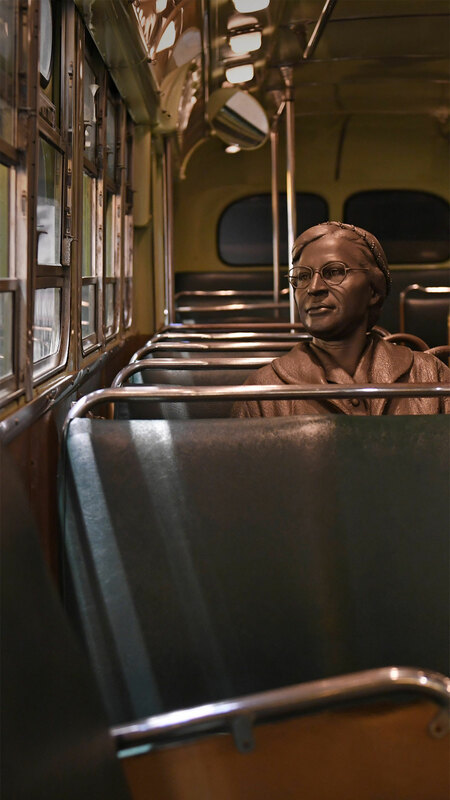 Here at the National Civil Rights Museum in Memphis, Tennessee, you can sit down next to a sculpture of civil rights icon Rosa Parks, who was born on this day in 1913. Parks was arrested in 1955 for refusing to give up her seat to a white passenger on a segregated bus in Montgomery, Alabama. Her defiant action sparked the Montgomery Bus Boycott, one of the longest and most successful movements against racial segregation in our nation’s history. At the time, African Americans made up most of the ridership on Montgomery city buses. The year-long protest finally ended when the US Supreme Court ruled that Alabama’s laws enforcing segregation on city buses and other modes of transportation were unconstitutional.